Ted Ligety’s injured left hand (Facebook photo). Let’s face it, the Birds of Prey men’s World Cup ski races this weekend at Beaver Creek will be a lot more interesting if Ted “Shred” Ligety is racing for the U.S. Ski Team. And it looks like he will, despite dislocating his left wrist while training at Vail’s Golden Peak late last month and undergoing surgery in Vail to insert four pins. Apologies to 37-year-old Bode Miller, but the 30-year-old Ligety is now the standout stud of the U.S. Ski Team. Miller, a four-time winner at Beaver Creek, won’t be racing here this weekend because of recent back surgery, but he hopes to return to Beaver Creek for the World Championships Feb. 2-15. So for both Miller and Ligety – owners of eight Olympic medals between them — to have missed Beaver Creek would have been a blow to organizers. But Ligety, also a four-time winner at Beaver Creek, looks like he’s on track to race in both Saturday’s super-G and Sunday’s giant slalom. His coach told Ski Racing Magazine Ligety planned to skip the super-G at Lake Louise last weekend, which he did, to focus on Beaver Creek this weekend. 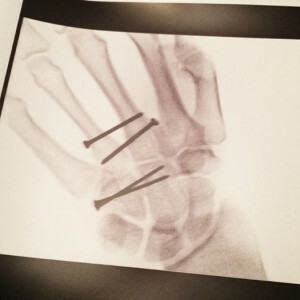 Ligety actually said it was lucky his injury occurred in Vail. Vail’s Dr. Randy Viola on Monday was named a head physician for the U.S. Ski Team. Ligety is tied for 16th on the all-time World Cup victory list with 23, just four wins behind Phil Mahre in the ninth spot. Miller is seventh with 33 career World Cup wins. Ligety is also a four-time World Championships gold medalist and the only American alpine ski racer with two Olympic gold medals (combined at Torino in 2006 and GS earlier this year in Sochi).